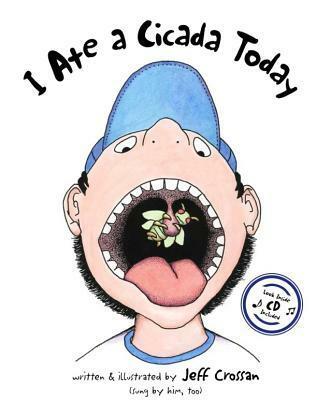 CBZ review for-- I Ate a Cicada Today By Jeff CrossanThis book is about a boy and his crazy antics. Doing such things as stealing the spots from a leopard, or hiding a giant squid. He certainly is mischievous and gets himself into some crazy predicaments.The idea for this book is great but I found the words just didn't flow well. They felt forced and not very lyrical. If the words rhymed or flowed better I felt that it could have been a brilliant book that kids would have wanted read again and again. The illustrations were stellar, but the writing was horrid. The reading rhythm was off too much of the time. Several of the subjects were bordering on non-PC, like cooking a leopard for a gourmet dinner. It was also a bit long for its intended audience. I was approved for the eARC on Netgalley in return for an honest review. I will not be reviewing this book on my Children's book blog because it is less than four stars. Oh, to be a kid again! Somehow this book, written by an adult, captures the essence of childhood just like the classic "I know an Old Lady Who Swallowed a Spider" did for my generation. I read this, I read it again, and I read it a third time out of glee, and just to myself...this is going to be THE go to book for birthdays and birth gifts from now on from me...so if you're having a baby or you have a little one and you know me...there won't be any surprises under the gift wrap:-)! "I peppered a leopard. ""I leapfrogged a wharthog. "This book is SO fun!! Pure joy and entertainment for kids. My nephew and I laughed and laughed while reading the book over and over again. And as if it couldn't get any better, the author shares an accompanying musical component! You'll be rhyming long after reading this one! The illustrations, I liked. The verses were.. meh.. I don't have much to say about this. It was nice but it wasn't anything special. Got this free from NetGalley. Although the illustrations seemed a bit rough and many of the rhymes were lame, about half of them were clever and made me smile. So overall, it was worth the read. Hope's review...along with Camille (10y) and Lily May (7): The story/song is very imaginative. Great rhymes that will leave you laughing even after you close the book. Lily May has only listened to it all the way through once and when I asked her about it a few days later she was able to quote almost every one of the verses main lines (...ate a cicada...hid a squid...photograph a giraffe...turtle in a girdle...etc). This shows how the story/song is inspirationally designed to grab the child's imagination. Our first attempt at reading the book was a let down though. I was asked to turn it off after two verses. Second attempt was with Camille singing along and that kept Lily May engaged. Although a wonderful book it is way too long for the age group designed for. Also, the county/folk song tempo is not contemporary and immediately engaging for kids in this day and age. This is the only reason I lowered my star rating. I'm not a good read aloud person so I used the cd. But anyone with a good storytelling voice would outshine the cd in a heartbeat. The book could survive without the cd but not vice versa. 4 stars I received this book for free from the publisher in exchange for an honest review. This does not affect my opinion of the book or the content of my review. What a fun little read. It is quirky and witty and written in rhyme and will have your kids laughing and asking for more. It has 16 verses of humorous scenarios from peppering a leopard to leapfrogging a warthog. The illustrations are done in ink and watercolour and are big, bold and sure to tickle your child's funny bone. A fabulous addition to the book is a CD of this song performed by Emmy-nominated songwriter, Jeff Crossan accompanied by his acoustic guitar. Jeff has inserted an "aside" after each fun animal encounter which will bring an added comedic zing to make you and your child smile even more. What inspired Crossan to write such a zany tale? He came up with several of the rhymes while eating with his kids at a restaurant the night the cicada chose him as a target and hit him , bullseye, square on the mouth. Oh my! Surprised by the attack his brain started imagining scenarios of other fun animals and he hurriedly scribbled them down on a napkin. Years later Crossan decided it was time to turn that song into a children's book for kids everywhere to enjoy. I know you will love everything the book has to offer. "I ate a cicada today. I know that sounds crazy to say. But it flew in my mouth, and it didn't fly out. I ate a cicada today. "For kids, especially 8 year old boys, who are enjoying language exploration, this could be a fun choice. The vocabulary, rhymes, and humor would most likely fly over the heads of preschoolers, but primary school students should get a kick out of both the book and the song as well.The illustrations are simple watercolors which enhance and emphasize the humor of the random, quirky lyrics. ("I followed a swallow today. She wanted me to go away. She swerved and she swooped. I looked up, and...oops! "This picture book comes with a CD, but my free review e-copy didn't include the audio files, so I've only heard a sample of the first few pages. I can't speak to the full song, but the sample certainly got stuck in my head! I think elementary school teachers could easily incorporate Crossan's book and music into their story times. Rhyming words and hilarious pictures are set to music in this children's book. The words and the pictures work seamlessly together to create very funny pictures of improbably situations. Have you ever peppered a leopard or leapfrogged a warthog?I'm not sure who laughed more, the kids or me. The accompanying CD is of the author singing the bold print words and saying the light print words. Hilarious! We loved the colorful pictures and after we'd listened to the music they wanted me to read it to them and then we talked about each picture. I can see this becoming a favorite. There isn't anything funnier to a child than the ridiculous. The author wrote, illustrated, and sang this book. Impressive. I hope he writes another children's book.I received this book free of charge from JKS Communications in exchange for my honest review. I received an electronic copy of this book for free by the book's publishers via NetGalley in exchange for an honest review.This was a hilarious rhyming book featuring animals and jokes galore. The rhymes were both witty and entertaining throughout and would be perfect to share with children. Though some of the rhymes were a little off, it was greatly enjoyable. If you purchase a copy of the book it is has a musical accompaniment, as I only have an electronic ARC copy I didn't get to have this whilst reading. I'm sure that it would make the book even more brilliant and it's one that I'd love to share with children. Disclaimer: I received a free digital ARC of this book via NetGalley for reviewing purposes.A hilarious set of silly rhymes in the vein of There Was an Old Lady who Swallowed a Fly, Shel Silverstein, Jack Prelutsky, and Ken Nesbitt. Great for children who like nonsensical plotlines, singing along, and any of the above authors/stories. The illustrations are well-drawn and goofy accompaniments to the song. It also included parenthetical commentary, which would be better read AFTER completing each poem, as it messes up the rhythm and pace. Our little boy enjoyed this more than our little girl but I myself found it funny and catchy and enjoyed listening to the CD that came inside with them. I think it would have been a bit better had the words rhymed more but still it was interesting and so beautifully illustrated that you'd want to read it again and again just to look at the pictures! I thought the artwork was cute ... and some of the verses really cracked me up ... but there were ones that were off in their rhyme and ruined the flow of the story. It got several giggles ... and even a guffaws ... from the kids I was reading it to, so that worked for me, and they loved the pictures and the animals in the story. This was really so much fun! It is a great book for parents to share with their children and laugh at loud! I can see grand parents enjoying this book with their grand children. Way to go, long after you have read this along with the children, the words stay in your head. it was cute. it had fun rhyming parts. i think i would be able to give it more stars if i heard the song that goes with it. otherwise, it was fun and i would read it again. I can't get these whimsical little rhymes out of my head. Loved it! Fun, clever read! Illustrations are stellar! The song element adds a playful twist to "story-time". Jeff Crossan - Jeff Crossan is an award-winning, Emmy-nominated songwriter. His hit songs include the number one country tune, “You’re Gonna Ruin My Bad Reputation,” which received a BMI Million Air Award. A graduate of the University of Richmond with a degree in journalism, he is a former newspaper reporter/photographer, music journalist and syndicated radio writer. For several years his cartoons appeared in the Presbyterian Voice. He lives in Franklin, Tennessee with his wife, Linda. They have a daughter and a son who have helped them assemble a fine assortment of mammals, reptiles, fish and insects.I Ate A Cicada Today is his first children’s book.